It’s that time of the year again. Yes, time to get out in your backyard for family barbeques, evening get-togethers with neighbors, even that quiet swing in the hammock by yourself. Whatever your backyard dream is, let us help you take your mind’s eye vision, design it and bring it to life for you. 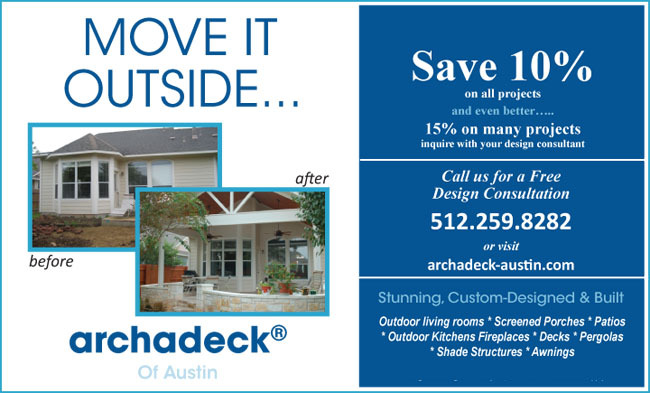 Archadeck of Austin, with more than 1,800 projects under our belts, offers you an outstanding offer to help you get the ball rolling on your backyard project. Whether it’s a deck built with beautiful and long-lasting composite materials , an all-around family gathering place screened porch or an open porch for a hot tub, we’ve got the expertise to make it happen. Or maybe you’re thinking about a multi-season room, pergola, gazebo, flagstone patio, outdoor kitchen. Your dream is our passion. Check out our ad in ‘Community Impact’ for a special offer. You can go ahead and get started with the backyard creation you’ve been dreaming of and get some help with your budget. You can depend on Archadeck of Austin to give you outstanding service and make your project experience a great one. Give us a ring for a free consultation at 512.259.8282. This entry was posted on February 21, 2011 by austinporchandpatio. It was filed under Austin decks, Patios, Special Offer from Archadeck of Austin and was tagged with Archadeck of Austin, Austin deck builder, Austin decks, Austin pergola, Austin tiger wood decks, Community Impact.